Many working Americans have jobs that require them to be on their feet all day. Whether you are standing in one position for 8 to 10 hours a day, or you are always on the go and never get a chance to sit, there are some important things to remember about maintaining a good standing posture. The first step in practing good standing posture is being aware that your posture is suffering. How do you know if you have poor posture? Well, do you feel upper or lower back pain after a long days work and being on your feet? Or do you find yourself with constant neck pains or a straining feeling? If you answered yes to either of these questions, chances are you are not standing with good posture. If you can admit that you have a bad stance during your day, that is the first step to fixing it. The main goal of having good posture relies on maintaining your neutral spine. Your neutral spine is the natural curve of your back that supports your body weight and enables you to move. The neutral spine consists of three curves that form vertically down your back. The top curve, known as the cervical curve, is located behind your neck and it’s in the neutral position when you are looking straight ahead. The top curve can become compromised if you are bending your head looking down at something or are turning it upwards for long periods of time. The next curve is the thoracic curve located in your upper back just below the neck and ends just above waist level and below the base of your rib cage. This curve is naturally curved outward. The thoracic curve can become compromised and overstretched if you are hunched over for long periods of time. The last curve is called the lumbar curve. 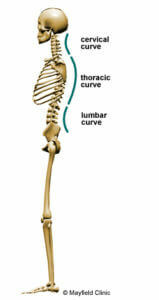 The lumbar curve is an inward curve like the cervical curve and runs down towards the pelvis. The lumbar curve can be impacted by not sitting upright in a chair or by hunching over while standing. When all three of these curves are in their natural position, this is called the neutral spine. The recipe for having perfect posture, is to keep these natural curves in their true form. When one curve is slightly off, your posture is immediately impacted because the curves typically all move together. For example if you are hunched down while you stand, the thoracic curve could become even more inward than it already is, thus placing tension on the lumbar curve to straighten instead of curve inward. The spine is amazingly flexible and it’s good to stretch every once in a while, but it’s imperative to remember to keep a neutral spine at all times. Something else to remember during your day is to stay on the move. Our bodies are designed to be in motion. 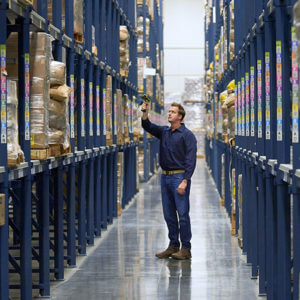 If you are stuck at one standing position for most of your day, be sure to take breaks every once in a while and do a lap around the warehouse or workspace. Even a short walk to the water fountain or bathroom will help every now and then. What you don’t want to do is stay in the same standing position for hours at a time. Take a few minutes to get a short walk in, or worst case scenario, do a few simple and quick stretches to switch things up for a minute. Your colleagues and customers will understand, we promise. Another helpful tip you can add to your list of standing posture techniques is to evenly distribute your weight among both legs. It’s probably rare for you to be standing on one leg the entire day at a job, but it is common for people to shift their weight from one hip to the other, lean on a work surface, or put one leg up on a shelf at the bottom of your work space. All of these are fine to do if you’re taking a minute break from your normal stance, but you don’t want to get in the habit of having a crutch like this for hours at a time. More than likely a leg or arm would start to go numb anyway after 10 minutes or so of holding one of these positions. Whatever crutch you take to, try to keep it short and then resume your good posture position. If you are on your feet all day long and really need some help with your standing posture, you are in luck because there are two affordable aids on the market that can significantly help improve your posture: posture braces and posture shirts. Posture braces have been around for years and they have been proven to be quite effective by chirpractors and doctors. A posture brace is a garment that can be worn over the clothes or concealed under your clothes. The brace serves more as a training device than a brace, as it does not completely support your back, but rather trains your muscles to practice good posture and achieve the neutral spine you once had. The SheerPosture is an affordable posture brace that is available in several colors and an adjustable one size fits all option. The SheerPosture brace is a great option for someone who is on their feet all day long and finds themselves slouching or holding a stance that may be causing them pain. Posture braces do a great job of training your back muscles to practice good posture once again because you are constantly reminded throughout the day that you are slouching. 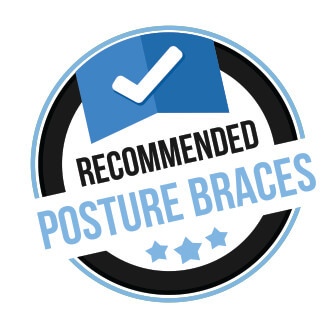 The braces gently pull your shoulders back which aligns the neutral spine and as soon as you stray away from that position, the brace will tug at you as you resume the poor posture stance. This triggers your brain to straighten up again. Once the muscles in your back build back up to the neutral spine position, you will be less likely to fall into that bad posture stance. The posture brace can be used less and less as your muscles become trained into that good posture position and eventually you may not even need the device. 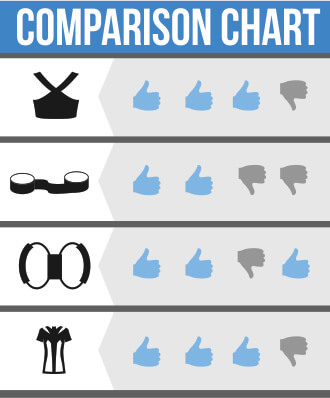 I have personally reviewed dozens of posture braces, vests, shirts, and apps and have a list of my recommended picks here. 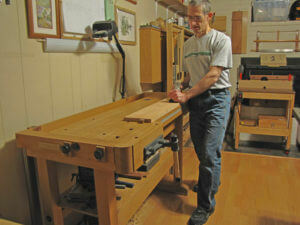 A posture shirt is also a great economic solution to practicing good standing posture. There are several types of posture shirts that can be worn underneath your clothes and conceal very well. 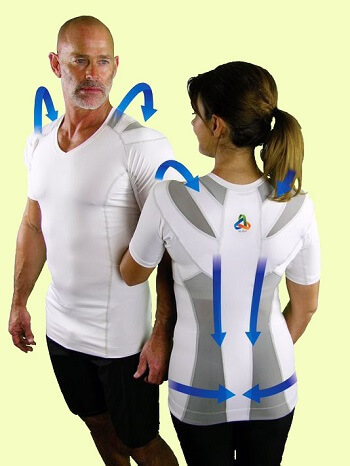 These special posture shirts have patented materials and activating elastic positioned in specific places on the shirt that trigger your postural muscles to activate when you slip into a bad posture position. This may be a good posture solution for you if you are on your feet throughout the day and do lots of heavy lifting and activity, as the shirts are usually designed for active adults. They are typically tight fitting and hug your body so that the materials can target your neutral spine and promote good posture throughout the day. Whether you purchase a posture training device, or you pay close attention to the posture tips mentioned above, always remember to be aware of your stance as much as possible throughout your work day. A good standing posture can be successfully achieved with a little work and possibly with the help of a posture training device. Next post: Practice Good Posture in 2018 – Which Posture Corrector is Right for You?